Olive Pink Collection. Water colour on card sketched by Olive Pink, Alice Springs, 1958. Arid regions (of Australia) Native Flora Reserve, Alice Springs. Identified by Olive Pink as botanical name Prostantera striataflora one "popular" name was the silly one of mint bush. Pink, Olive 1958 , Olive Pink Collection. 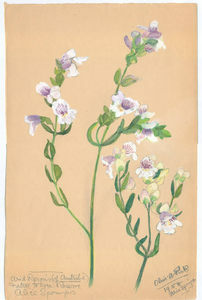 Water colour on card sketched by Olive Pink, Alice Springs, 1958. Arid regions (of Australia) Native Flora Reserve, Alice Springs. Identified by Olive Pink as botanical name Prostantera striataflora one "popular" name was the silly one of mint bush. , University of Tasmania Library, Special & Rare Materials Collections, Hobart.